+ Do I have to make a reservation? Yes, we are by reservation only. You cannot just show up for a tour. The cost is $92 per person. Cancellations must be made one week prior to your tour in order to receive a refund. + What is your inclement weather policy? + How many ziplines do you have? 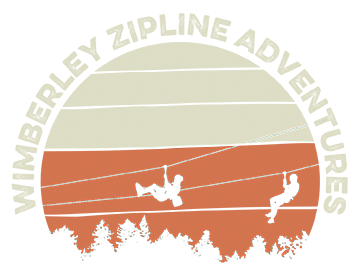 We have a total of 10 ziplines that are all included in the tour. + Can I come and only do a couple of ziplines? No, the course requires you to fly all 10 ziplines. We do not have any smaller packages available. + How much hiking is involved and how strenuous is it? Throughout the tour there is about half a mile worth of hiking. The hiking is spread out in between the ziplines, you will only hike for five minutes at a time. The hike is uphill on uneven terrain, we compare the hike to walking up three flights of stairs unassisted. + I don’t want to zipline, can I still do the hike? No, unfortunately it is not possible to take the hike without ziplining. The hiking is separated in between the ziplines. + My friends are coming to zipline but I don’t want to, can I go and watch them? We can accommodate a couple of observers on each tour. You will not be with them the entire time because you will be separated by ziplines. There will be a small amount of hiking involved. We will station you at a couple of different landing platforms where you can watch them fly in and take pictures. You will be able to see the first 5 ziplines, the last 5 are positioned through the trees which cannot be observed. We will take you back to the welcome center where you will be able to see them fly in on our last line. You will need to wear tennis shoes or hiking boots. Opened toed/opened heeled shoes are not allowed on the course. Observers have to be at least 18 years old or be accompanied by an adult. Observers can not be reserved and are not guaranteed. + How long does the tour last? The tour will last about 1 1/2 to 2 hours depending on group size. + Do I need to arrive early? Yes, you will need to arrive 15-30 minutes ahead of your scheduled tour time. If you arrive late you may miss your tour. At this point your deposit will be nonrefundable. + What do I need to wear? You will need to wear tennis shoes or hiking boots. Opened toes/opened heeled shoes are not allowed on the course. Pants or shorts will work. If you wear a pair of shorts we recommend wearing a pair that reaches to the mid thigh, any shorter then this and the harness will rub on your legs throughout the tour. This is for your own comfort. Please dress according to the weather. On a cold day please bundle up, if you end up getting too warm we can hold on to extra layers. We will supply you with all of your gear and bottled water. Please bring a method of payment to pay your balance. We accept Visa, Master, Discover, cash or check. We also have souvenirs for sale. We recommend that you bring a camera or phone to take pictures. We have phone pouches available for $10.00 so you don’t have to worry about dropping your phone. + Do you sell any beverages? Yes! We have just opened our Biergarten (beer garden) where we sell a variety of beer, cider, spritzer and soda. These will be available for purchase after your adventure. No. We do, however, have GoPro Hero3 cameras available to rent. This camera will mount on the front of your helmet and video record your whole adventure. You will get a 16GB SD card with the video of your tour. We do have a limited availability so please call our office to reserve one ahead of time if you are interested. The cost is $30.00. This amount is to be paid upfront to reserve. + Can I bring my own gear/gloves/helmet? No, you will need to use the gear we provide to zipline. + Can I wear a backpack? No, you can not carry a backpack. We can make exceptions if there is a medical need. + Can I bring my GoPro? Yes, you can bring your GoPro with your helmet strap/chest mount or mount it to one of our helmets. You will not be allowed to bring the selfie stick (arm extension) or tripod on the tour. + Can we bring a picnic? No, we will need the space to accommodate the next tour. The town of Wimberley has a beautiful park called the Blue Hole with rock picnic tables. + I don’t want to pay for everyone in my party. Can I set a reservation and have everyone pay their own deposit? Yes, we can set up a group reservation to allow everyone to call in their own deposits. We will set a deadline for payments based on how far in advance you are booking your reservation. + How many people can be in a tour? At each tour time we can book up to 25 people. We will then split the group into two smaller groups of 12 or 13. + When do you close for the season? We are open year-round. The only days we close are Easter, Thanksgiving Eve, Thanks, Christmas Eve and Christmas Day. + Are your tour times different throughout the seasons? We offer tours at 9am, 11am, 1pm and 3pm throughout the year, with an extra 5pm tour during summer. The 5pm tour time only becomes available once all other tour times are full. + What are the age and weight restrictions? Our minimum requirement is 9 years old and 65lbs. Our weight max is 220lbs for women and 250lbs for men. + Can I sign the consent form for my son/daughter’s friend? No, the release form will need to be signed by the minor’s parent/legal guardian. You can find the release form under the Book A Tour tab or you can request one to be emailed to you. + Can my daughter/son ride with me on the zipline? No, we do not offer tandem ziplining.